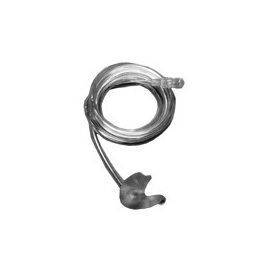 Monaural stethoscope complete with PVC sound tubing and female Luer connector- comfortable single ear piece for constant monitoring of the patient. The monaural stethoscope is molded of sufficient durometer to accurately reflect sound- yet soft enough to assure comfort while being worn. The ear piece is more or less C-shaped and is inserted into the grooves of the ear. Clinical experience indicates that the medium size normally fits the greater proportion of users.